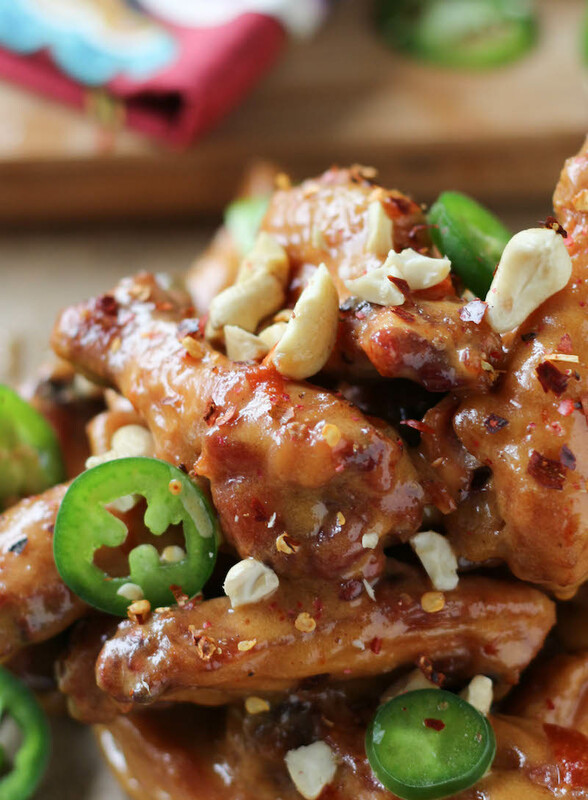 These wings are what sticky and messy wing dreams are made of. Make sure you wash your hands before you dig into these because your hands will be covered in this sauce and you’ll want to slurp every every bit that’s left behind. Wait. I said slurp and I’m grossed out now. What a disgusting word. But there’s really no better word to explain this sauce. It’s so damn good. 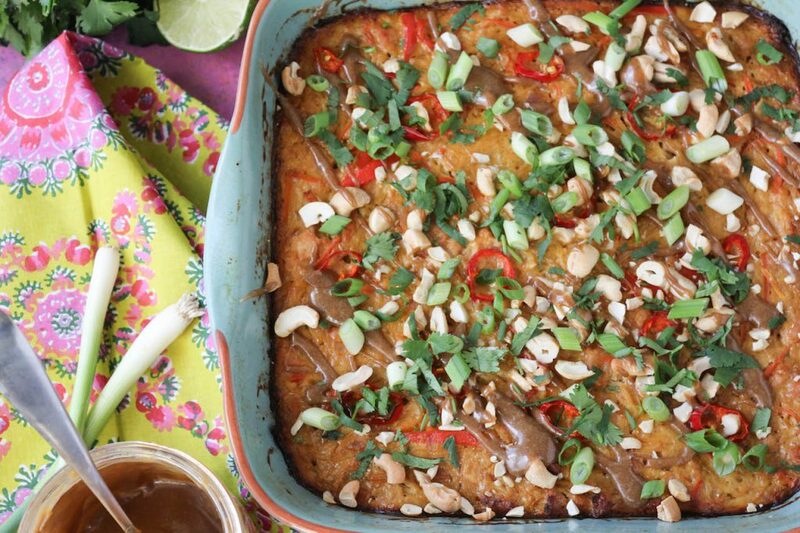 It’s the same sauce I use for my Pad Thai Casserole and it can really go on top of anything. I’ve put it on pork chops and rotisserie chicken and it would be BOMB with shrimp. Just saying. Make every, slurp daily. Well we are officially off to Costa Rica! Yesterday was our 1 year wedding anniversary and it was spent working, working out and running errands. But now our bags are packed and we are ready to enjoy time together, just the two of us, exploring a place that we have made no plans in! I’m so pumped for that. I’m looking forward to coffee at a local coffee shop, surfing, zip lining, maybe ATVing and eating my weight in plantains. I wish I had more to say but I’m in vacation moooooode! But not to worry, I still have all my posts ready to go for you guys while I’m gone. A new fashion post tomorrow, more recipes next week, podcasts, and everything in between! Until tomorrow, Pura Vida! 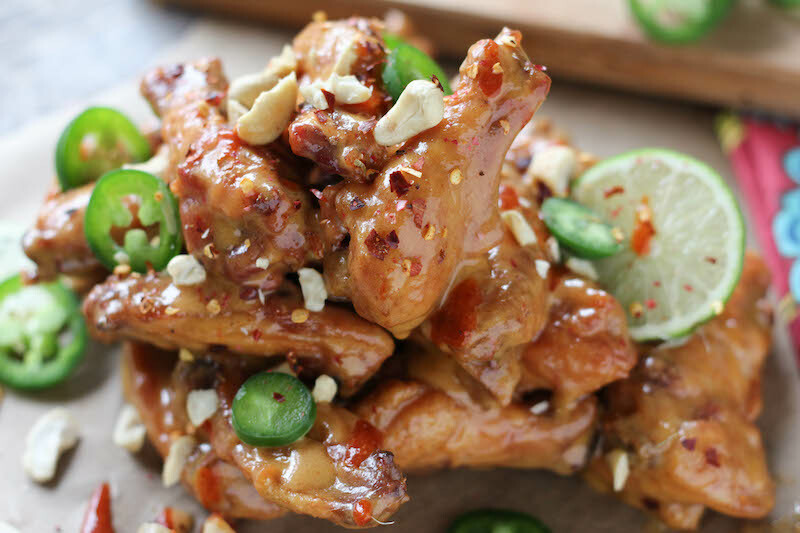 No wait, stop what you’re doing and go make these wings! GO! 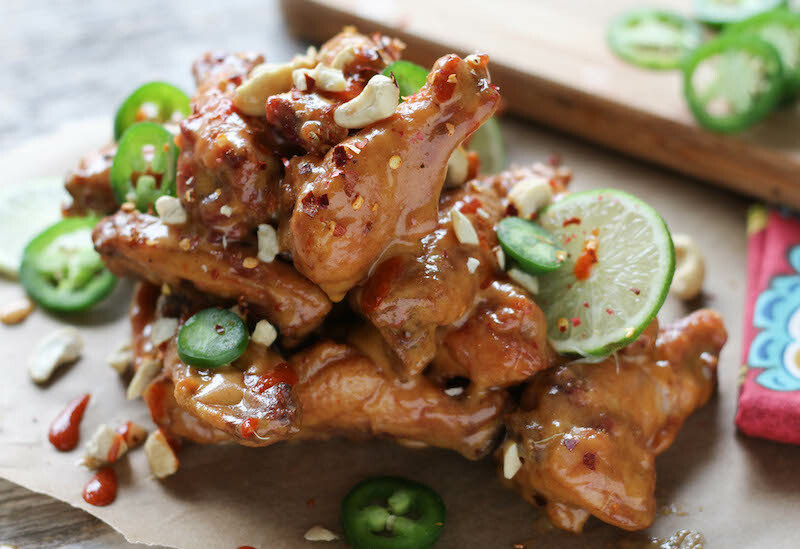 When wings have about 10 minutes left, place all ingredients for the pad thai sauce into a blender and blend until smooth. Set aside. 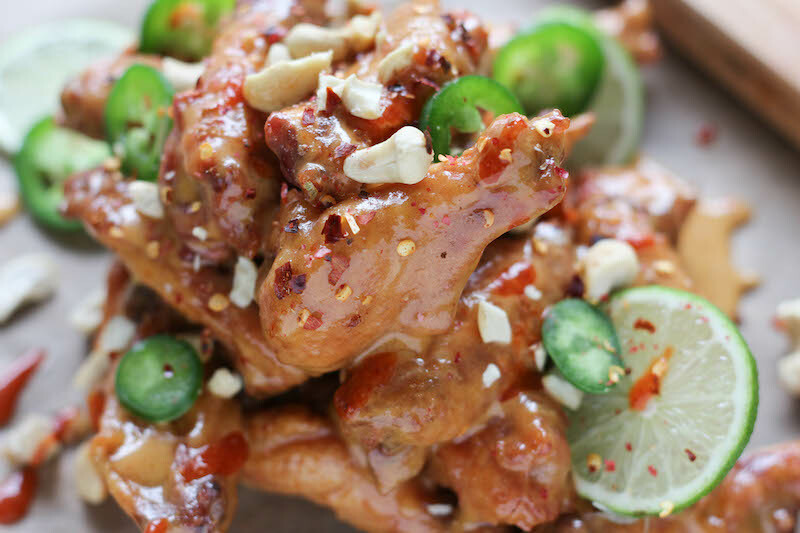 Pour sauce in a large bowl then add wings to the bowl and toss to coat. 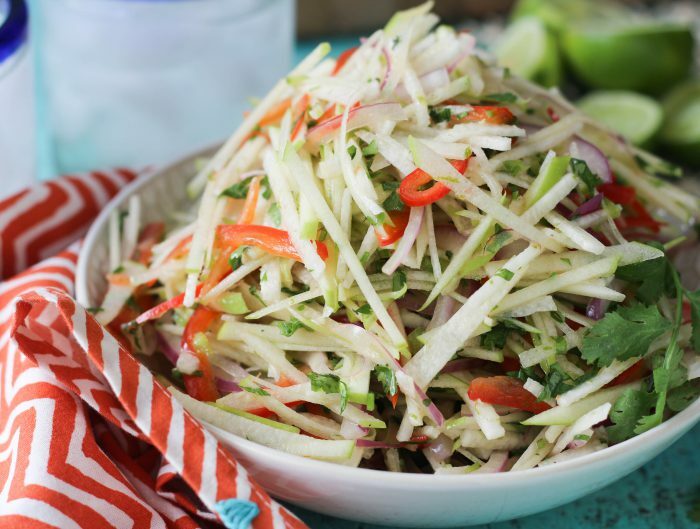 Then sprinkle with jalapeños, cashews, sriracha and red pepper flakes and squeeze fresh lime juice on top! Wash your hands then eat up and prepare to have extra dirty afterwards! 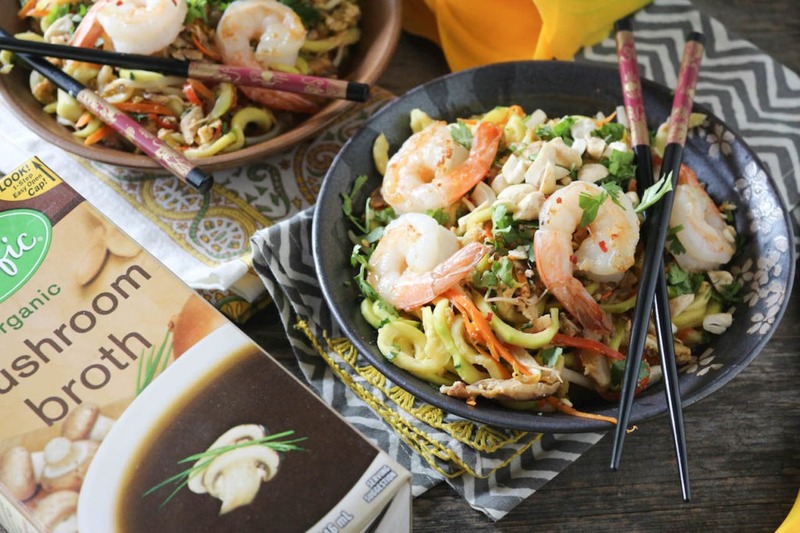 The sauce for the pad thai casserole is freaking amazing (it’s my favorite of your casseroles that I’ve tried so far), so I already know this recipe will be a hit! Also… Just got your Paleo Cookbook… I’m trying to write a list of which recipes I want to make first but it’s soooooo hard to choose from all the yumminess! The food photography makes my mouth water. 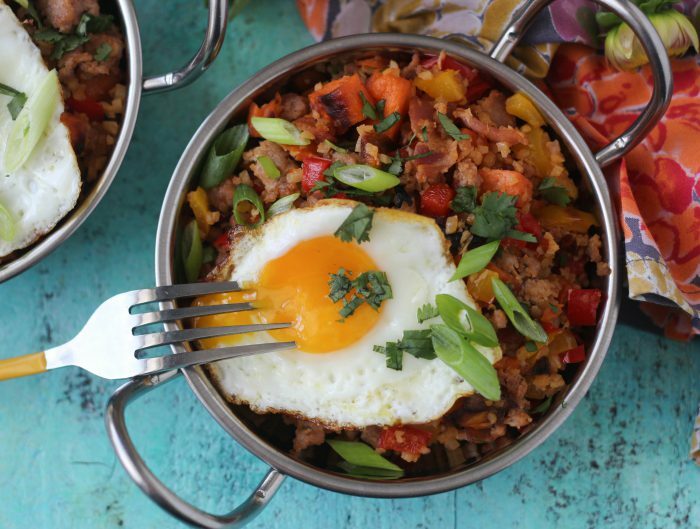 You really know how to make paleo delicious! I agree on that sauce! I made extra and put it on chicken that week! Hi Juli! Unrelated to this post…I’m looking for a post that I thought you wrote on recommendations on what to do/eat in Denver. We have a trip coming up in May and I wanted to start planning out our trip. I looked in your travel section but didn’t see anything there (unless I’m missing something). Or maybe I made up the fact that you wrote a Denver post…if so, please do one!! :) I live in San Diego and your SD post was spot on so I’m looking forward to what you’d recommend in Denver. TIA! just simple water for me! Hi Juli! I was wondering what your favorite cookware is. I know it can be different for stovetop and oven. Also, do you use a Vitamix or another type of blender? Any other kitchen must-haves? i mostly use cast iron skillets and le creuset. and i use a blendtec. i think a food processor is definitely a must have! Looks so good Juli!! Was wondering if there’s a hack or way to make the wings without the wire rack (don’t have one and can’t seem to find a cheap one!). Also, are these wings good for the next day? I like to make a lot and bring to work for days after. Thanks girl!! Hi Julie, what could you use instead of sunflower seed butter? Would tahini work or another nut butter? Thanks. These look AMAZEBALLS!!!!! 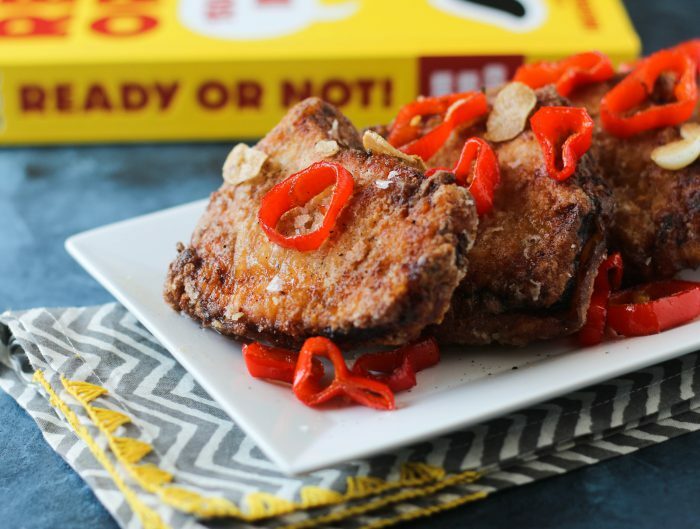 Your sticky wings in your latest cookbook are mine and my husbands favorite!!! Cant wait to try these! yay!! hope you love these ones too! This looks incredible! Looks like the perfect dish! Yum! I like your Frenchy! I made this pad Thai sauce and put it on a baked pork tenderloin. So yum! Then as a side I made a broccoli salad and put your creamy avocado cilantro dip all over it. I love how versatile your food can be, Juli. Keep up the goodness. 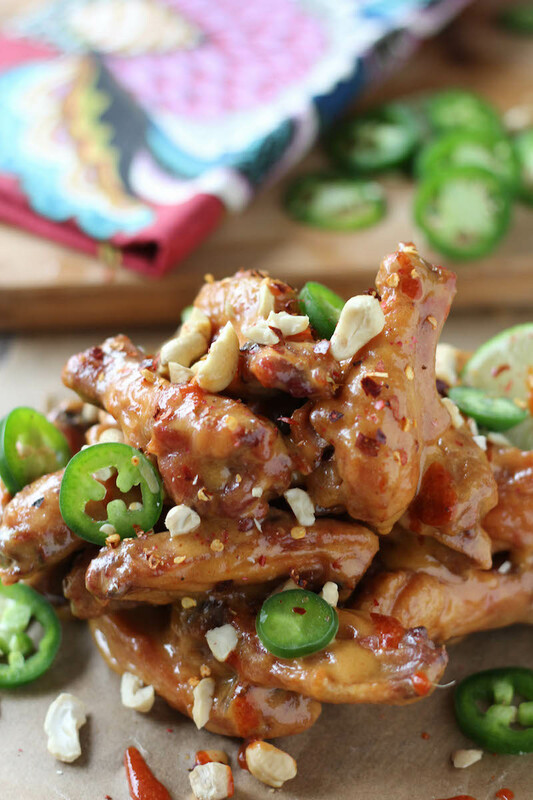 This pad tai chicken wings recipe is freaking amazing! Just had it for dinner and both my hubby and I couldn’t believe how good it was. Definitely a keeper! Thanks for the recipe Juli! yayyyyy!! thanks for reminding me of this recipe, i love this one too!! and i definitely prefer peanut butter too lol! Just preparing some party fare and was wondering if this sauce can be made one day prior to serving ? Thanks again and Merry Christmas to you and yours from Canada! my sister and I DEVOURED these… probably a little more than we shoulda had. i used PB because i had that on hand and it was fantastic! YUM. you always have the best recipes! thank you! Hi! I was wondering if this would work with regular size chicken legs? Think the cooking time would be any different? Thank you!! Excited to try this one! yes, the cooking time would just be different!